Connect your notebook to a wireless 54 mbps and 11 mbps network without any cables! With this wireless 54Mbps PC card it is possible to connect a notebook to a wireless 54 mbps and 11 mbps network. 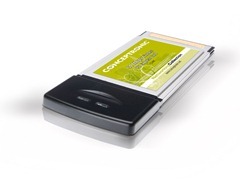 Conceptronic C54RC is based on the Ralink RT2500 series 54M wireless chipset.